Massive open online courses (MOOCs) such as our free Udacity HTML5 Game Development course (CS255) have the incredible ability to reach a global audience, but language barriers still prevent many students from participating. Today we’re announcing some steps we have taken to break these barriers down. As part of an initiative to empower developers in emerging markets with high-quality training content in local languages, Google funded a project to translate a large portion of the Udacity web development curriculum into Spanish and Brazilian Portuguese. Specifically, we teamed up with Udacity to add fully translated subtitles for CS253 (Web development), CS255 (HTML5 games), and CS256 (Mobile Web Dev, launching soon—register free today!). 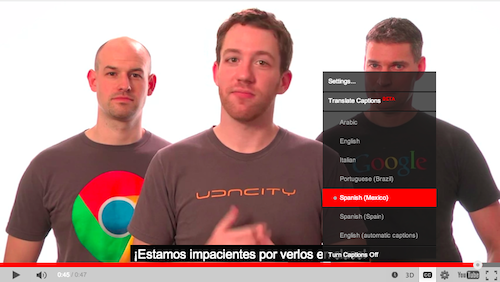 To see the translations live, go to, for example, www.udacity.com/course/cs255 and start taking the class. When you're in the classroom watching videos, click on the Closed Captions (CC) button on the YouTube player and select Spanish (Mexico) or Portuguese (Brazil). One of the CS255 students, Edwin Rodolfo Maldonado Perez from Guatemala City, Guatemala, told us: "In Latin America, if you study in a public school you won't have access to learning a second language like English. When public school students grow up and look for jobs, they don't have time or money to go to a decent language school. From there it becomes a chicken-and-egg situation, where to get a new job or improve technical skills like learning a new programming language, people find that almost all developer documentation is in English." The translations for CS253 and CS255 are already live. Enjoy! +Peter Lubbers is a Program Manager on the Chrome Developer Relations Team, spreading HTML5 and Open Web goodness. He is the founder of the San Francisco HTML5 User Group--the world's first and largest HTML5 meetup with over 8,000 members. Peter is the author of "Pro HTML5 Programming" (Apress) and, yes, his car's license plate is HTML5. In his spare time he likes to run around Lake Tahoe in one go and jump out of airplanes.